Photo courtesy of David Wartinbee. 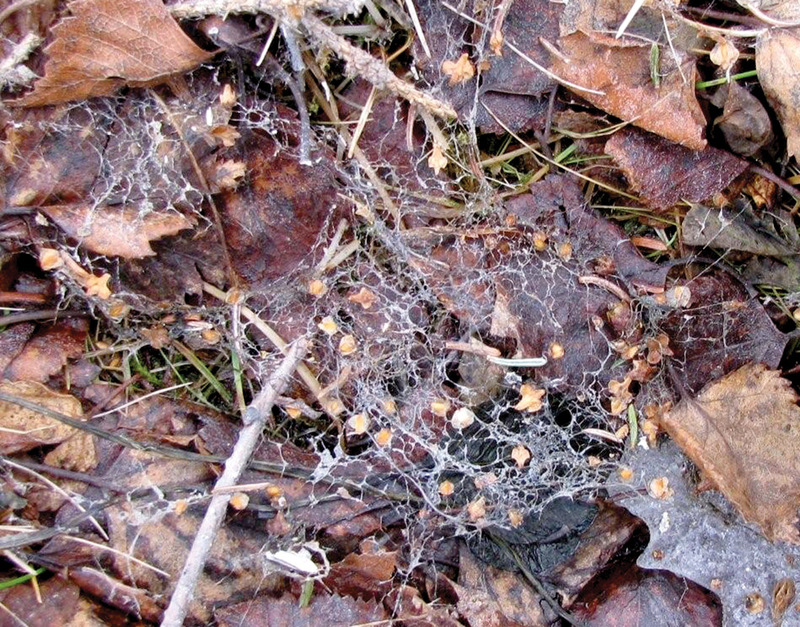 Cobweblike mycelia remain on the surface of leaves and grass after snow melts. The fungi are a form of snow mold, which can which can be gray or pink. The days have lengthened enough that I’m ready for spring and summer. However, this year we have received a couple late-season snowfalls that just aren’t melting nearly fast enough for me. I’m done with ice fishing and I’m ready for boating and summer fishing trips. But, before the lakes thaw, I know the snow in my yard has to go away, too. As that snow melts, an unusual occurrence will show itself, if you’ll look for it. Mixed in with the lowest layer of snow, just above the grass or the leaves, lie numerous fine strands of fungal mycelium. The cobweblike strands are embedded in the snow and become visible on the grass as the snow disappears. This mold requires moist conditions, so once its protective snow cover melts, the fungi dry up and die off. Next year they will re-emerge from the spores they leave behind. Just so you know, you may have to get down on your hands and knees to actually see this fungal growth, since the mycelium really are as fine as a spiderweb. Look particularly along the edges of the melting snow. The mycelia are the remains of a group of fungi that are collectively called snow molds. Their name indicates where they can be found and the habitats where they thrive. Basically, in the early spring, these molds grow within and under the snow, right above the grass. The minute strands of mycelium push their way through moist snow and into dead plant material. They feed by digesting organic material trapped in the snow as well as on the dead grass and leaves below. While we don’t think of snow as being tainted with organic particles, there are actually all kinds of material in the most pristine-seeming snow. If you melt snow in a bucket, you’ll find things like bud scales, leaf fragments, seeds, tufts of lichen, bark remnants, tiny twigs, etc. All of these are used for food by the dozens of snow mold varieties. As snow temperatures warm in the spring and there is some liquid water in the snow, the fungi sprout from hardy spores. They grow very well in temperatures close to freezing and the snow covering the grass provides insulation from periodic colder temperatures. The really harsh cold of winter prevented their germination until now. With a blanket of snow for insulation, a little liquid water and organic materials for food, the fungi grow rapidly until they lose their protective snow cover. Then they dry out and die back. While many of us may have never seen any of these snow molds, they are very well-known to those who care for manicured lawns or golf courses. If the snowmelt takes an extended period of time, the fungi will feed on the dead grass leaves and can cause patches of light-colored turf in the middle of an otherwise green lawn. The mycelia can be dull gray or an interesting pink; hence the common names gray or pink snow molds. In most cases, these molds are only consuming dead grass blades, but some of the different varieties can actually kill underlying plants. Turf care experts generally recommend thatching to remove excess food for overwintering snow molds. They also suggest cutting and raking grass just before snow falls so you remove potential food sources. And it is suggested that minimal fertilizers be used late in the season so there aren’t lots of long leaves that die off over the winter and provide nutrients for the fungi in the spring. The good news is that most of these molds do not kill the entire layer of grass. Normally the discolored patches will dry out once the snow melts and that kills the mold. Then, new growth should sprout from the underlying grass roots as summer arrives. Snow molds are members of a fungal group called “fungi imperfecti.” This name comes from their apparent lack of a sexual reproductive stage. Instead, they reproduce by producing thousands of asexual spores on minute fruiting bodies. The spores then geminate when proper conditions occur. Several fungi imperfecti are important as sources of antibiotics (e.g., penicillin) or for their roles in flavoring cheese (e.g., proprionibacter — Swiss cheese). Many fungi are able to live in some very harsh conditions. The snow molds are a good example of this hardiness, and if we look, we can see their remains for a few weeks as our snow melts away.